Integrated Professional Competence Course is the identification for the second level of the CA (Chartered Accountancy) Course conducted by the ICAI (Institute of Chartered Accountants of India). The course is identified as IPCC and the examination at the end of the course is identified as IPCE (Integrated Professional Competence Examination). This is the second level for all students taking up the chartered accountancy course after getting through the CA CPT (Chartered Accountancy Common Proficiency Test). The duration of this course is 10 months and it is the starting period that the students gets registered for the course to the time the student completes the coaching and other formalities required for being eligible for appearing at the main examination. There is no stipulation to the minimum age required for the course. A pass in Senior Secondary Examination (12th) or a pass in the Common Proficiency Test (CPT) are the eligible requirements to enter into this course. Not only that, the candidates who are willing to pursue this course and passed intermediate or graduation either in supplementary basis are also eligible for the course. This Integrated Professional Competence Course (IPCC) exam is conducted under the governance of Institute of Chartered Accountants of India (ICAI). There are two levels in IPCC viz. Inter and Final. The exams conducted for the completion of IPCC course at every level are called Integrated Professional Competence Examination (IPCE) exams. At present IPCE exams are going on. After completing the exams, the students waits eagerly for their results. Instead of waiting for the results, the students can check for their answers/solutions written by them. 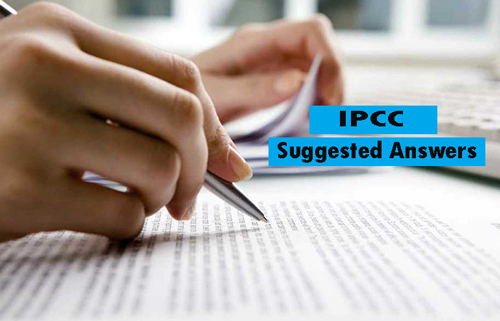 Here we provide key or solutions for the papers under the heading “IPCC Suggested Answers for November 2017”. Click the links below and check the solutions/answers attempted for different papers are correct or not. Here we provide IPCC Suggested Papers Nov 2017 for the students who attempted CA IPCC Nov 2017 term examination. Candidate can download previous year question papers along with its suggested answers /solutions. Now let’s look for some of the suggested papers for the candidates who are willing to prepare for IPCC. The above provided links you can download CA IPCC suggested answers of Accounts, Law Ethics & communication, Costing and Financial Management, Tax, Advanced Accounts, Auditing and Assurance, IT and Strategic management in both Group – 1 and Group – 2, of previous exams i;e May 2017, Nov 2017.